Travel Day, Sunday May 31. Traveled from Marion, NC and Tom Johnson Camping Center. First stop was a overnight stay in Bonnville, NC at a winery from Harvest Hosts group. Next day we got back on the road and traveled to Salem, VA and a stay at the Dixie Cavens Campground. We visited the Cavens at the campground. 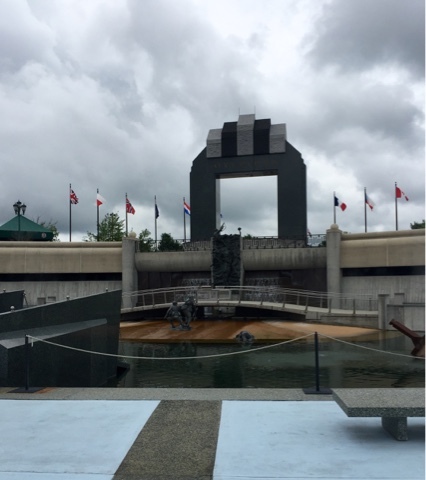 The next day we also visited the WW II D-Day Memorial in Bedford, VA.
We then traveled about 344 mile to Hambury, PA and a overnight stay in the parking lot of the Cabelas Sports Center. 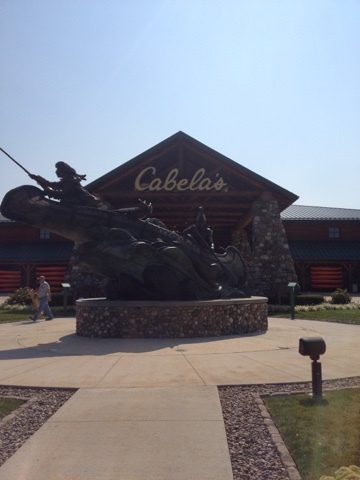 This Cabelas had space for about 50 RV's to park overnight. The next morning we were back on the road. After about 266 miles we made it to Deer Run Campground in Schaghticoke, NY. Schaghticoke was both of our home town growing up. We both lived and went to high school in this small town about 20 mile northeast of Albany, NY. This was our first stop back home. We visited with family & friends. The next day, Saturday, June 6th we attended Bonnie's 40th yr. Class Reunion from the Samaritan Hospital School of Nursing. On Sunday morning June 7th we moved up about 40 miles north to the King Phillips Campground in Lake George, NY. We are going to be staying at King Phillips till Becky & Dennis have the closing on our new home in Queensbury, NY. At that time we will be helping them with the moving in to the new house. Our next planned travel/trip is going to start in July. We are traveling to Bar Harbor Maine and than to Hopewell Care New Brunswick & Halifax, Nova Scotia , Canada. Then we are back home to Queensbury, NY for a few months. Have some work items on both the RV and a few things to do at the new house. We both have enjoyed spend time with family and friends. I have been playing some golf with by golf guy's. And just enjoying walking and hiking around the Lake George area.